The MOST DIFFICULT thing I have done in a VERY long time is taking the Improv Class I’m currently enrolled in. The teacher, Greg Hoyt (http://www.imdb.com/name/nm1701702/) is great, my classmates are wonderful and supportive… my “problem” is me. My “natural way of being” is the EXACT OPPOSITE of what of what I think is expected in a good Improviser. I don’t “do voices”, I have an extremely limited emotional range (my wife says I’m really happy 99.9% of the time and really pissed off .1%), I don’t remember names well, (let alone lines, objectives, etc.). I don’t emote my emotions, I tend to be internal and not very expressive… all of these things are the exact opposite traits of a typical Improver. Stay with me… I’m not beating myself up… I’m being honest. These are current realities. I know there are many things that I’m incredibly good at… one is my ability to put myself into situations that really stretch me… and I love that. I live my life pretty fearlessly… I love that about me. I’m a great Santa and a good person… I get all of that and I like myself. Why am I even taking this class? You’re really good at your Santa thing, you don’t need to be doing this Improv stuff. I don’t even want to act like a guy who finds conflict and exaggerates it, this is just not who I am. Etc., etc., etc. In other words I’m “IN MY HEAD” thinking rather than being committed to being in the moment. I’m not just relaxed, reacting and having fun… Being “in my head” is taking away from my performance. This is NOT a first for me… I have been self-conscious of many things over the years. It’s NOT what I’m lacking that is causing my angst… It’s what I’m thinking. I’m thinking about my shortcomings because I have NOT clearly identified my “why”… the reason I’m doing this at all. I have been consistently asking myself why? Why? Why? Why am I doing this? Why am I pursuing performing? Entertaining? Why is Improv important to me and my objectives? For me knowing why I do what I do is essential. I MUST understand, feel good about and be compelled by WHY I’m doing what I’m doing in order to be “all in”. So, WHY am I interested in performing? I’m not… at least not directly. That has been the root of my angst! I’m interested in having a positive impact. I’m interested in doing things in a big way while doing things that I like. I’m interested in doing things that invigorate me. Getting on TV and possibly in the movies where I can have a positive impact in a huge way excites me. I get invigorated by the thought of making millions of people smile. Now with my WHY clearly defined I’m absolutely certain that my preparation (my improve classes, acting classes, etc.) will be MUCH easier, not because I’m better but because I’m all in and will do whatever it takes to gain the skills and leverage my assets in whatever ways necessary to be successful at this. 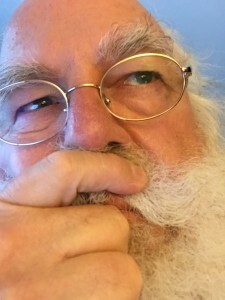 I’m confident the become more comfortable and confident with Improv will make me an even more extraordinary performer as Santa, and as other characters, and I know that this increases my odds of doing more, and doing what I do better so I can have a greater… more significant impact. One final thing… the money is also important. VERY IMPORTANT! 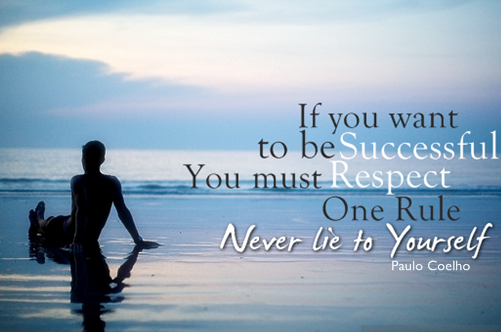 I’m committed to earning a significant amount of money and this pursuit, acting, allows me the opportunity to do that. I’m NOT pursuing acting FOR the money… but I want to maximize the money I earn while doing this. Does that make sense? Now that I have clarified this in my own mind I feel as if a weight has been lifted off of my chest… weird. I didn’t expect that. I have also decided, in this moment, that I AM an artist. Performing is an art. I have NEVER seen myself as an artist. I have friends who are artists, my wife is an artist. I have always admired artists of all kinds… but I didn’t identify with them. From this day forward I do. I AM AN ARTIST! 60 weeks ago I announced ( http://the-greatest-gifts-of-all.com/year-long-sabbatical-starts-today/ ) that my wife and I had embarked on what we intended as a yearlong sabbatical. Our intention was to focus on our health, spiritual/personal development and new vocational pursuits… and what an amazing 60 weeks it has been. 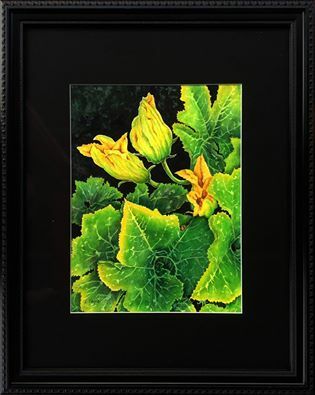 Lori’s lifelong love of “making something from nothing” has bloomed into some amazing original artwork. Her creativity has also been expressed in several new websites she has made for some of our own personal projects as well as for some of our “Santa friends”. And too I have made a huge transition. I’ve left the work I spent the last 20 years doing behind and I’ve embarked on a new project that I could not be more excited about. 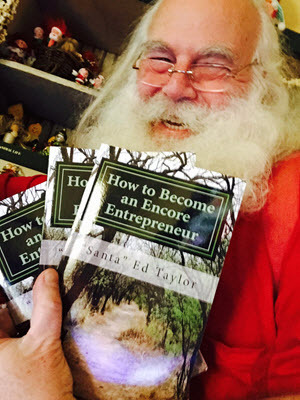 I’m helping people 50+ become successful “Encore Entrepreneurs”. I wrote a book, developed a seminar and a 7 week course all designed to help baby boomers more fully enjoy their 60’s & 70’s. This sabbatical has helped me identify and prioritize the most important elements in my life. Spending time with, loving and encouraging my family. Using my experience and strengths to help others. Building a substantial financial nest egg. With those things firmly in mind Lori and I will end our sabbatical in 2 weeks. We’ll be spending much of the next 6 months in Southern California further developing our “bodies of work” and the distribution channels we’ll use to allow our work to reach and serve large numbers of people. Are you ready to take a break from your routine to do something new, stimulating and different? Remember, you can work while on a sabbatical, the idea would be for the work to do something you aren’t now doing, perhaps writing a book. For me, I earned a very nice income while on sabbatical, and I did a bunch of new, exciting, things. And you don’t need a year… perhaps a week would work. I think you could use your vacation time as a sabbatical, the distinction would be to use the time to be more introspective rather than distracted. I guess my reputation preceded me. Someone, told someone, etc… and my phone rang… the long & short of it I was invited to speak to a group of Toastmasters. The talk was VERY WELL received, unfortunately it was not recorded but I think my notes will serve you well. Nearly every person in the room came up to me after the meeting and thanked me for the 3 Gifts I give in the talk. Thank you for asking me to join you this morning. I'm incredibly honored. You probably know that I don't really live in Santa's Village at the North Pole… but I do live in a village up north. I live in Ashland, Oregon which is nestled at the base of the Siskiyou Mountains just north of the of the Oregon border. Ashland is home to about 25,000 who love the charm and quaintness of small town life. 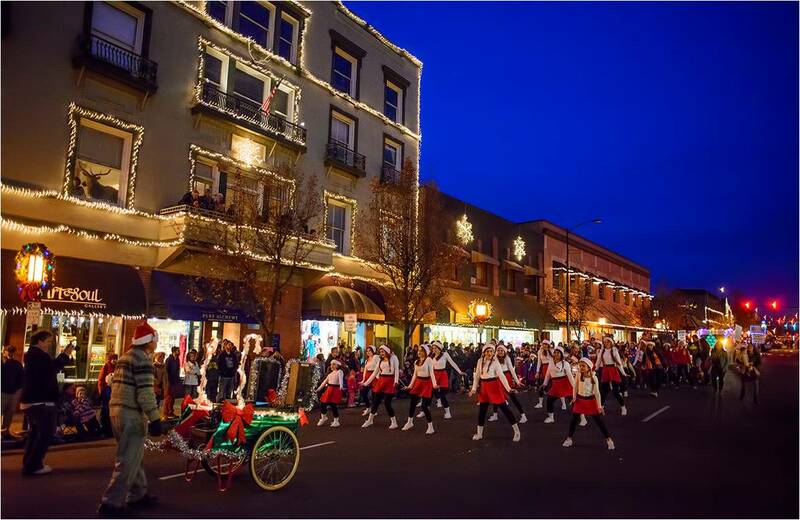 One of the most popular events in Ashland is its Annual Festival of Lights parade and town lighting which happens the Friday night after Thanksgiving. 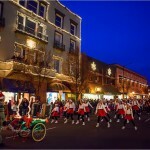 The Chamber of Commerce estimates that between 15 and 20,000 people line the streets for the small town parade and the Grand Illumination of Plaza in the heart of town. It's usually pretty nippy in Ashland in late November, often in the 30 or low 40's. So you just imagine the streets lined with people bundled in their Christmas sweaters and hats and boots… Carolers and warm cider and hot chocolate and even roasted chestnuts. It really a wonderful event. The parade starts Scout troops, the high school marching band and the kids who are performing in the Nutcracker and several other entries make their way down the short 10 minute parade route. Who is the final entry? 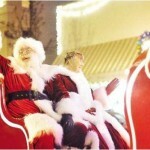 Yes, it's me and I'm sitting tall in a sleigh made out of plywood by local volunteers. It's painted red and placed on a small flat bed trailer that's towed behind a decorated pick-up truck. 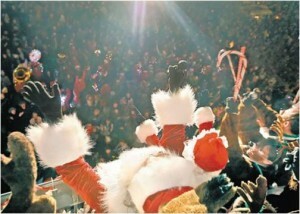 I'm waving and Ho Ho Hoing… Having a blast. As the sleigh makes its way down the parade route the spectators fold in behind us and we make all converge on the Plaza at the town center. This is where all of the spectators gather for the GRAND ILLUMINATION. I dismount from the sleigh and make my way through the crowds. I navigate up 2 flights of stairs to the balcony at Alex's Restaurant that overlooks the Plaza. When I looked down at those thousands of people how do you suppose I was feeling? Before you answer let me tell you this happened in November, 2008… now and let's jump back 30 years to November 1978. I was 24 years old pleading with a co-worker, Mary Nelson. I was a new real estate agent and I had just listed a home for sale. 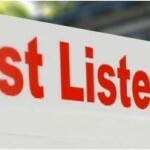 The custom at the time was for the "Listing Agent" to get up to a microphone, in front of 80 to 100 fellow Realtors at the weekly Multiple Listing Breakfast, and "pitch" their listing. I was pleading with Mary to "pitch" my listing for me and she, in a very caring, Mother Knows Best, kind of way Mary tried to convince me to do it myself, telling me how important it was for me to get comfortable pitching my own listings. Of course I knew she was right but I'll tell you here and now… I couldn't do it. There was absolutely no way, I mean there was a zero percent chance that I would get up in front of that group and "pitch" my listing. Yes, I had a 5 month old baby at home, and no, I didn't have enough money in the bank… but I could not overcome the fear and get up in front of that group to pitch my listing. Why? Why is it that I could not get up in front of that group and talk for 90 seconds about this house that I had just listed and so desperately needed to sell? While your thinking about that let's go back to the balcony 30 years later. How do you think I was feeling when I looked down at that massive chanting crowd with the microphone in my hand? Let me tell you, I was exhilarated! I could not have been more excited. I had none of the paralyzing fear that I had 30 years earlier with the Realtors. What is it that can move a person from experiencing sheer terror at one time in their life and then at a later time in a similar situation experience sheer joy? What changed? The answer of course is- I changed. The process of going from terrified at age 24 to exhilarated at age 54 started with Toastmasters in 1988. As a started learning and developing speaking skills I began to change. I gained confidence and I started questioning the beliefs I had that had been limiting me. As I look back I can now see that learning new skills, gaining self confidence and choosing empowering beliefs are 3 of the Greatest Gifts I have ever received in my life. Here's what I mean, I believe that each of us are endowed by our creator with innate gifts and talents. We are born with them, they are a part of our life essence and when we recognize these gifts and talents and use them for the benefit of others we experience a deep sense of self-satisfaction and contentment. We feel our lives have meaning and purpose. Letting your life speak… means you are listening to your inner self and you are allowing that inner voice to guide your actions. Causing people to smile and laugh has always made me happy. In school I lacked the confidence and outgoingness that it took to run for class office… but I was always something of a class clown. I also noticed many years ago that I seemed to naturally gravitate to leadership positions. A quote I heard many years ago has stuck with me… it said, "A leader without followers is just a person taking a walk…" I didn't want my life to be that of just a person taking a walk. So for me letting my life speak has meant being a leader and teacher. Public speaking has helped me do that. How we experience our lives is determined, entirely, by the beliefs we filter our information through. In other words the meaning we give to the events in our life are entirely determined by our beliefs. If we are fearful it is because we have adopted beliefs that undermine our confidence, or make us self conscious, these beliefs limit our ability to fully realize our potential. It was my BELIEFS, not my lack of speaking skills, that kept me from getting in front of that group of Realtors… even though intellectually and logically I was absolutely certain that making that 90 second pitch would be in mine and my families best interest. Here's what I'm suggesting, spend a few hours in silence thinking about your beliefs and your actions, and lack of actions. Identify the beliefs that empower you and move you to live aligned with your highest vision of yourself… and also identify those beliefs that hold you back and limit your growth and development. The mere identification of limiting beliefs will often start the process of them slipping out of your life. One of the beliefs I adopted is that personality trumps perfection. I believe perfection equals paralysis. I started giving speeches before they were perfect… long before… the fact is I have NEVER given a perfect speech. I realize that at times I um and ahh too much… sometimes I have pregnant pauses and other times I speak too fast… AND, and this is key, despite all my flaws I have earned well over a million dollars in speaking fees and product sales… I also have hundreds of testimonials and reviews singing my praises… I'm always looking for ways to improve… but I'm VERY OK with being who I am, how I am. Don't worry… just have fun. Learning new skills and adopting new beliefs has allowed me to not only be comfortable, but be exhilarated, standing on the balcony looking down on the sea of humanity. Seeing those faces brighten with smiles as I began to speak… that warms my heart… and lets me know that I am letting my life speak. I'm on track. I feel blessed that I am able to make people smile and add a few minutes of happiness to people's lives. But I do think it's important to remember that I'm not I'm doing this for others… I'm trying to be the best version of me I know how to be… for me. I simply like myself better when I can be a source of joy… when I can be a trigger for positive emotions. Becoming comfortable speaking in front of groups has earned me a lot of money but what is MUCH more important is that public speaking has allowed me to live more congruently; by getting in front of thousands of groups and sharing my information I have made lives better, some much better, and that makes me feel good. By being a teacher and leader I'm letting my life speak. Public speaking has helped me create an outward version of myself that more closely matches my inner vision of myself. 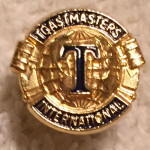 I owe a HUGE debt of gratitude to Toastmasters for creating a vehicle that allowed me to more fully live into who I'm here to be… and I want to thank each of you for allowing me to share my story and for allowing me again today to feel that maybe in some small way I have made a life a bit better. I wish you all, all the best, and I ask each of you to join me in helping to keep the Spirit of Christmas, the love, the consideration and the fellowship alive ALL YEAR LONG! Everywhere I go I'm recognized as Santa Claus, in fact just today I was stopped at both the gas station and the grocery store and asked if I would take "selfies" with people. I LOVE IT! 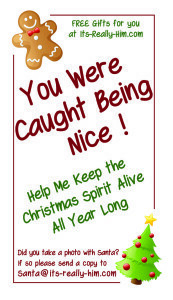 Each time I'm stopped I give away my "You Were Caught Being Nice" cards. People love them. There is nothing promotional about the cards. I'm NOT doing this to get business, I just think they're fun and it gives children and adults a little memento from their chance meeting with Santa Claus. Now I want to add to that experience… and here's how you can help. "FREE Gifts for you at Its-Really-Him.com"
Here's where you can help me. Please send me your suggestions. I'm primarily looking for things that can be done easily and at no, or low, cost. I'm also looking for some "rules" for family activities. Perhaps things like no cell phones, no ridiculing or arguing, etc. 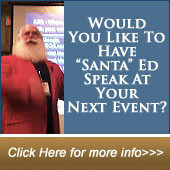 My hope is to create a rich resource of activities that help people experience the Spirit of Christmas all year long. How do we experience the Spirit of Christmas? We experience the Spirit of Christmas by demonstrating love and by being the recipient of demonstrated love. We demonstrate love by behaving in loving ways, by doing things that are considerate, compassionate, thoughtful and helpful; these are all human embodiments of the Christmas Spirit. Relationships are the vehicles through which our love can be demonstrated and the "gifts" I'll be providing are intended to enrich relationships. 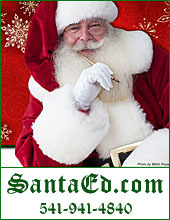 If you have any thoughts or suggestions please leave them in the comment area below or email them to me at Santa at SantaEd dot com. A reminder just popped up on my calendar letting me know that next week is the 18th anniversary of my first $10,000 day. Every year for the past 17 years I have taken a few minutes to think about that day and the events that led up to it. In the preceding months I had hit bottom. I went broke. Lost my house, my car, closed down my business (which in the early '90's had generated a low 6 figure income) but by '95 things were bad and by mid '96 they were unimaginable. My world, my business, my family, everything was incredibly disrupted… I was embarrassed, ashamed and at times I found comfort in simply, mindlessly, playing solitaire. 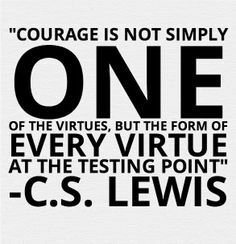 I saw an opportunity… and even though I was depleted in every sense of the word I mustered the courage, and the will, to move forward. The opportunity was the Internet… more specifically, teaching small business owners how to use the Internet to build their business and add to their profits. That day, October 17, 1996, I took 4 phone calls from small business owners wanting my help… in hindsight I can tell you with absolute certainty that depositing that $10,000 in my anemic bank account wasn't nearly as important as the deposit that was made in my "emotional bank account". Because others valued me, and trusted me, and because I knew I could exceed their expectation (which I went on to do) my spirit came back to life. I regained my sense of meaning and contribution. I saw a light nearing from what had been a very long and very dark tunnel. Today I would never value a person's worth, mine or anyone else's, in terms of money but when we become emotionally depleted providing value to others and being compensated for it, financially or otherwise, can be just the defibrillator we need to bring our spirit back to life.